As a life-long Star Wars fan, I can’t contain my excitement about Rogue One, and I find myself even more excited for it than I was for the Force Awakens. That’s a bold statement to make; much alike many other millennials, my entire life has been defined by George Lucas’ (now Disney’s) science fiction epic – and that’s long before Force Awakens or Rogue One landed in cinemas. There’s an iconic scene that comes to mind. The opening of the original Star Wars, mixed with the aesthetic of inserting a VHS tape into a VCR. The light, black box with two mystic wheels which somehow, once spun in that container of wonder, told a story that captivated me from that day forward. The opening crawl, and roar of John Williams’ score as an opening script – which my mother used to read to me, before I was truly able to read it myself as a boy – and finally the flashy overhead siren that was a rebel ship being pursued by a dagger-like Star Destroyer. That scene is well-referenced in an abundance of film guides and academic papers. The makeup of the opening crawl, a port from Flash Gordon – the sound of laser fire, captured by Ben Burtt. There are many reasons I’m gripped by Star Wars, but that scene was the progenitor not only for a life that’s been defined by a galaxy far, far away, but further by mysticism, technology, the belief in right and wrong, and perhaps even a well-touched element of humour. I grew up in a fortunate time as a Star Wars fan – even if most would now disagree. I learned to read and write in the backdrop of many of the elder (now non-canon) Star Wars novels; particularly by Michael Stackpole’s X-Wing series, and I spent the waning years of childhood through the release of Episodes I-III. Even if, looking back, they were nothing on the original trilogy, it was a magical time to see the origins of Darth Vader. Hell, even if he whined about sand. The interim period between Revenge of the Sith and the next Star Wars film was a desolate one. At the time of the release of The Clone Wars television show and film, I’d grown out of the target demographic it was aimed at and only returned to the television show towards its conclusion (or cancellation). The news that Disney had swiftly acquired Lucasfilm was a daunting one, as well. I was left to fear that the saga I had grown to know and love would be relegated to the children’s work it was often derisively referred to as. Instead, to my relief, The Force Awakens released last year to critical and commercial success. Watching it as the most hardened of critics – a die-hard fan – I walked out smiling. The Force Awakens did indeed do something miraculous. It took a timeless story and modernized it, and introduced new characters that we were compelled to care about. It took the best parts of the prequel and original trilogy, stripped out the rest, and even managed to craft something new. Kylo Ren was fantastic; a character full of fury and lacking any of the restraint that dominated the prequel trilogy. Finn introduced an Americanized character which was instantly relatable – as close to an everyman as a Star Wars film character can be; neither the epic hero nor the gruff, reluctant savior. Lastly, Daisy Ridley’s construction of Rey was one of the most charmingly calculated portrayals we’ve yet had in the series. However, for all its success, The Force Awakens was a very different kind of Star Wars; one almost made alien. It re-introduced new characters well past their prime – both a sad and pleasant advent. It tapped into a mysticism lost on the science of the prequels, but failed to extend the mythology of the original trilogy. And, lastly, it flung the concept of the used-future which was so brilliantly employed in the original trilogy so as to place itself in the future. For a story told ‘a long time ago’, I felt closer to the future than I had ever before in the Star Wars universe; a terrific irony. There were other niggles as well; its rapid pace, conversion of a character (Luke) who we grew up with into near messianic legend, and, further, lens flare. Alright, I’m kidding on the last one. I cannot lie. I walked into the cinema as a true fanboy, and I walked out of The Force Awakens with as much of a grin on my face. What had shaped by childhood had made a triumphant return. However, there was a darkness, a certain light grit that was missing. And now, in December this year, Rogue One will return audiences to as close a juncture to A New Hope as we’re ever going to get. I’m more excited for the release of Rogue One than I was for The Force Awakens for a number of reasons. Rogue One tells a darker, more mature story; one we know the ending of before it even begins. While characters might survive, the overall premise is a grim one. Felicity Jones’ Jyn Erso is headed on a suicide mission; a collision course with one of the ultimate evils of the Star Wars universe. There’s a sense of triumph in the music of Rogue One‘s trailers; that subtle mix of John William’s Skywalker and Imperial March themes mixed into one; a duality of light and dark that shapes the Star Wars saga as much as the Force itself does. 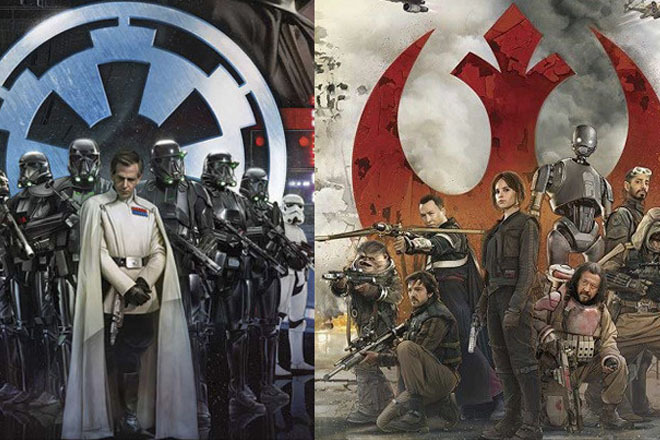 I largely feel it’s a strident piece of music that perfectly marks the bold steps Rogue One is taking to situate itself in proximity to the original Star Wars films; Disney-led re-shoots or no. The used-future is back. Things are older, more decrepit, and centered in the same tone we found ourselves in during A New Hope. Characters aren’t striving to be an ideal; there’s none of the Jedi-pretentiousness of Attack of the Clones, nor the Rey-style innocence of Force Awakens. Instead, there’s a gritty, dirty acknowledgement of truth. There’s also hope. The Jedi (or, most of them) might be long dead in Rogue One, but the mythology lives on. Chirrut Imwe, as portrayed by Donnie Yen, conveys as much in the official teaser trailer. Extensions are made to other parts of the Star Wars canon, as well. We see an abundance of new characters in Rogue One, yet none that feel patently out of place in the Star Wars universe. Whereas Force Awaken’s stormtroopers look like something closer to Star Trek, Rogue One’s Death Troopers are hardened, dirty, and look downright terrifying. The ensemble cast is back, as well. Where Force Awakens was a journey told in trinity – Rey, Finn, and Kylo Ren (with a brief fork to Oscar Isaac’s Poe Dameron in the third act) – Rogue One is an ensemble story told on two sides; a closer mirror to the story-telling style Irvin Kershner employed in The Empire Strikes Back. Lastly, there’s one more extension I’m excited to see; diversity. Star Wars (in canon material) repeatedly makes its clumsy foray at diversity through integrating countless alien species that pawn off one embarrassing racial stereotype after another. Rogue One is different; these are human characters with real influences (however fictional) which, to a certain degree, can’t escape their nature. It feels like a more expansive, rolling sea of a universe with different hands at the helm instead of caricatured alien species. I still love Star Wars. There was a certain giddyness about me during the opening sequence of The Force Awakens, where The Finalizer rolled across the screen in a style very reminiscent to the Star Destroyer in A New Hope. That excitement will never die, and it pervades everything to do with Star Wars that I can get my hands on. However, Rogue One is personal. This is a close return to the story that began it all, and concludes just ten chronological minutes before the scene that shaped my life forever. However it tells it – and whether it be good or bad – I can’t help but find myself eager to return to that galaxy far, far away, which shaped my life a long time ago. What are your thoughts? Let me know in the comments below, or drop me a line on Twitter @bryansmithSA!